Now available from Felco Australia , Felco pruning saws are designed to cleanly and precisely cut branches of a larger diameter. The Felco pruning saw range come three models, the 600, 610, and the 620. The 600 is a compact pruning saw with a folding handle and a 16cm blade. The 610 and 620 models come with a choice of 24cm or 33cm blade length. All pruning saws from Felco Australia feature a pull-stroke cutting action. 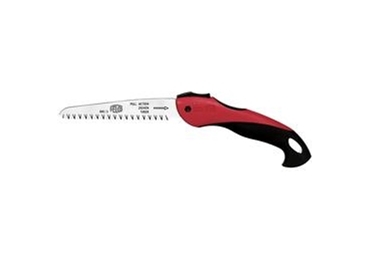 Felco pruning saws are reliable tools that offer a clean, precise cut. They are rust resistant with a hard-chromed blade made of high quality steel. Teeth on the blade are impulse heat treated and all pruning saw parts can be replaced. Felco pruning saws are also efficient and require little to no maintenance. They feature a conical blade shape that cuts without clogging and the set and shape of the teeth prevents sap build-up. In addition to these benefits, pruning saws from Felco are ergonomic with a comfortable non-slip handle.